President Makoto GONOKAMI is giving the congratulatory speech at 2018 SNU Matriculation Ceremony on March 2. 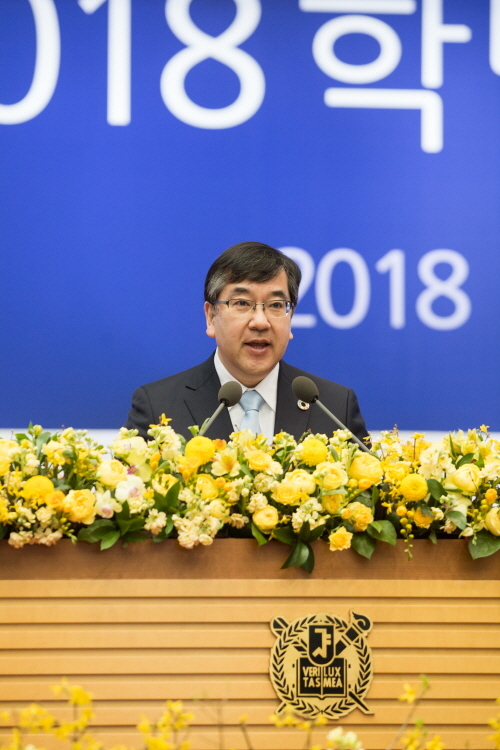 President Makoto GONOKAMI at the University of Tokyo gave a congratulatory speech at SNU's 2018 matriculation ceremony on March 2nd. President Gonokami opened the speech with special congratulations on SNU freshmen, saying "Even in Japan, we know how difficult it is to enter your university." He warned them, however, that "searching for the correct answers to the questions you are provided will not be enough" in this era of the digital revolution. President urged the young students, "you must strive for an active learning experience, coming up with your own questions and creating new knowledge to answer them, learn to look deeper into the principles behind things." He emphasized the 'discipline' to keep thinking until finding answers and generate new ideas. Congratulations to all of you on entering Seoul National University, a university with a global reputation, and a very difficult entrance examination. Even in Japan, we know how difficult it is to enter your university. On behalf of the University of Tokyo, I congratulate you on your achievement. I would also like to congratulate your families, who have supported you and are present here today to join in these celebrations. I extend my deep appreciation to President Sung and the members of Seoul National University for inviting me to this ceremony today. Personally, I have built close friendships with the current and past president of Seoul National University through mutual visits. One of your past presidents is a member of our university’s global advisory board. Together in East Asia, our universities strive to contribute to the well-being of humanity through higher education and cutting-edge research. We are indispensable partners. Our two countries have much in common culturally, and the University of Tokyo and Seoul National University bear a similar responsibility and mission to our respective countries: to sustain their social foundations and to produce future leaders who can steer all of humanity to a better future. The world faces many challenges today. These challenges transcend borders and are becoming increasingly complex and urgent. On the other hand, the digital revolution has given people the ability to share their feelings with others instantly. During the PyeongChang Olympic Games, people from all over the world watched athletes’ performances and shared their excitement in real time. The deep friendship shown by two athletes from South Korea and Japan transcended the competition for victory and was burned in our hearts. Sport, like scholarship, has the power to bring people together across all divisions and boundaries. As a citizen of an East Asian country, I am very happy to see the success of the PyeongChang Olympics as a wonderful celebration symbolizing a peaceful world. I am sure that the coming Paralympic Games will also be a great success. The digital revolution is bringing about a historic change, both in our economies and societies. Some call it the fourth industrial revolution. We share the responsibility to make this change lead to a better future society for all. I believe this change is also a great opportunity. The physical space we live will become more and more integrated with cyber space. In such a world, knowledge becomes the center of value creation. The transformation to such a knowledge-intensive society is discontinuous. We should call it a paradigm shift. Most importantly, this society has the potential to realize an inclusive society where diversity is valued and everyone can achieve their full potential. It has a potential to reduce disparities of many kinds, if we use new technologies wisely. To grasp this change as a chance for all humanity, it is important to appreciate and make full use of our diversity of knowledge. Asia has a historical and cultural background different from the West. As universities located in Asia, we have created a body of unique knowledge and have contributed to solving social issues and creating a better society. In other words, we have added to the world’s diversity of knowledge. In 2010, Seoul National University, Peking University, and the University of Tokyo worked together to launch a program called “Campus Asia”. This program aims to strengthen cooperation among our three universities, because strengthening Asia’s academic culture and nurturing highly-capable professionals are becoming increasingly important. Students from the University of Tokyo who took part in this program submitted reports about their experiences. I have learned from those reports that at first some of our students were concerned that it might not be easy to understand one another. But living together and having discussions and interaction with students of Seoul National University, they learned to appreciate differences and developed friendships. I also learned that some students from Seoul National University were interested in Japan’s ageing society as a common problem facing East Asian countries, including their country. In each region and culture, people acquire and develop their own unique knowledge. By combining bodies of such diverse knowledge and connecting their strengths, we will be able to find solutions to many difficult issues. I believe that is the key to harmonious and sustainable development for all humanity. You are the future leaders of East Asia. You can use our unique knowledge to make the world a better place. To realize a better future society, I hope that you will face up to social changes and build a genuine sense of empathy between people that is based on knowledge. All of you must be eager to take on new challenges in study at this university. You will soon learn that studying at university is different from studying for entrance examinations. Passive learning, --- searching for the correct answers to the questions you are provided---, will not be enough. You must strive for an active learning experience, coming up with your own questions and creating new knowledge to answer them. You must learn to look deeper into the principles behind things. You need the discipline to keep thinking in the face of setbacks until you find the answer. Only then will you be able to generate new ideas. I hope that you will acquire this strength during your time here. I hope you will make full use of the wonderful learning environment at Seoul National University and develop the ability to learn on your own initiative. I also hope to see deeper exchanges between you and our students at the University of Tokyo. As partners, I hope that you and our students can join together to chart a new and exciting course in these times of change. Finally, allow me to conclude by offering you my best wishes and wishing for the greater prosperity of Seoul National University. Thank you very much.